Fashion meets function â€“ this exquisite statement Rebel At Heart Grey Leather Watch radiates good Karma! The design of the crown at 9 o'clock is based on the popular Kathmandu Bead, while the grey sunray finish dial elegantly places the round case centre-stage. Framed by a grey vintage-look leather strap, this men's watch with the iconic Thomas Sabo design codes is the ideal, stylish companion. The iconic Thomas Sabo Rebel at Heart Collection is full of rock 'n' roll style, with detailed craftsmanship and blackened sterling silver. 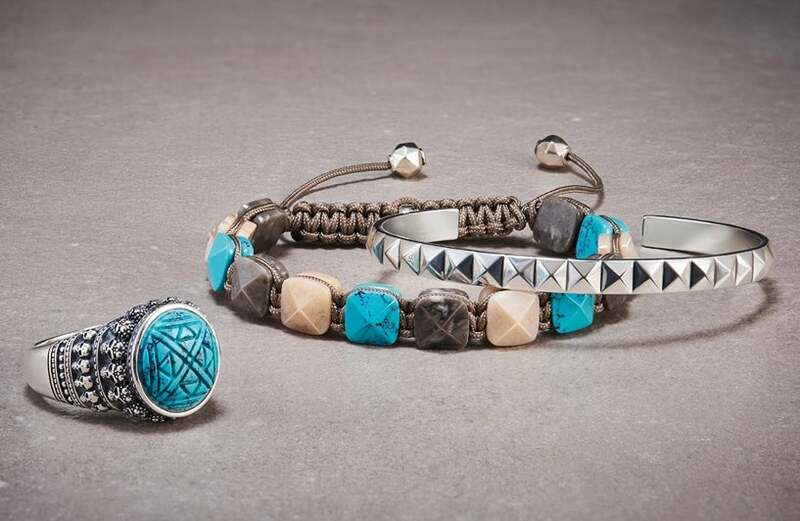 A subtle mix of materials make these pieces perfectly versatile when adding to any outfit. Embrace your rebel at heart today! https://www.johngreed.com/rebel-at-heart-grey-leather-watch 132375 Rebel At Heart Grey Leather Watch https://www.johngreed.com/media/catalog/product/n/c/nc6173_0_1.jpg 148.99 249 GBP InStock /Men/Men's Wedding Jewellery & Gifts/Men's Wedding Gifts/Gifts for the Groom /Men/Men's Wedding Jewellery & Gifts/Men's Wedding Gifts/Gifts for the Bestman /Men/Men's Gifts/Occasions/Father's Day Gifts /Men/Brands/Thomas Sabo /Men/Brands/Thomas Sabo/Watches /Women/Brands/Thomas Sabo/Rebel at Heart /Men/Brands/Thomas Sabo/Men's Thomas Sabo Rebel at Heart /Men/Men's Stainless Steel Jewellery /Men/Men's Leather Jewellery /Women /Men /Men/Watches /Women/Watches /Women/Brands/Thomas Sabo /Women/Brands/Thomas Sabo/Watches /Men/Sale /Men/Men's Wedding Jewellery & Gifts /Men/Men's Wedding Jewellery & Gifts/Men's Wedding Gifts /Men/Men's Gifts /Women/Brands /Men/Brands /Men/Men's Gifts/Occasions /Thomas Sabo 25% Off /Women/Spring Sale Fashion meets function â€“ this exquisite statement Rebel At Heart Grey Leather Watch radiates good Karma! The design of the crown at 9 o'clock is based on the popular Kathmandu Bead, while the grey sunray finish dial elegantly places the round case centre-stage. Framed by a grey vintage-look leather strap, this men's watch with the iconic Thomas Sabo design codes is the ideal, stylish companion.